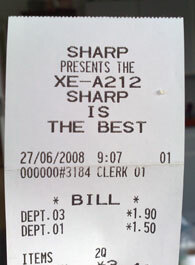 As I sorted my receipts (for expenses purposes), I took a trip down memory lane. I remembered meetings and coffees and lunches and appointments and clients and friends. When I found the receipt above, I remembered thinking that the cafe had failed to set up their till properly. So rather than being reminded of this particular cafe, and seeing their name again, I get an advert for the Sharp XE-A212 till. Marketing is all about little opportunities like this. It’s just about gently reminding people that you exist.